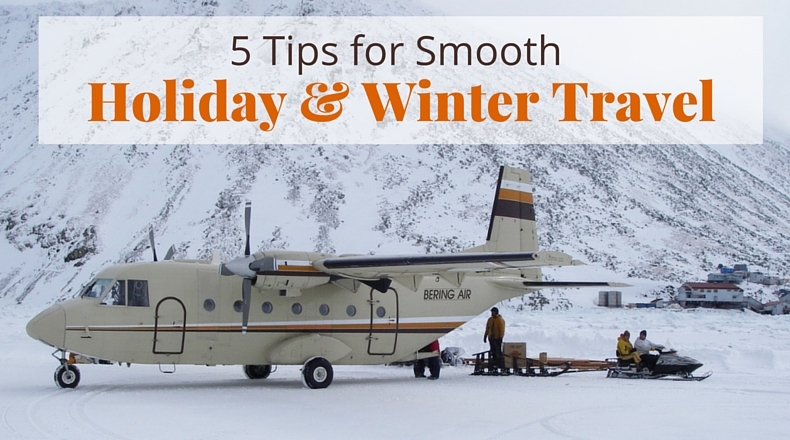 Winter is fast approaching in Alaska, and ‘tis the season for holiday travel. Whether you’re traveling home to spend time with family or heading to the various events taking place in the villages, we want to make sure you arrive at your destination safely. Before you take flight, check out our five best tips for holiday and winter travel. Will you be exchanging gifts with friends and family? A smart way to lighten your travel load and minimize baggage fees is to ship any gifts ahead of time. Plus, you’ll have less to lug around while you’re dealing with other winter travel obstacles. Another travel-friendly option is to shop online or send gift cards to their favorite store, restaurant or coffee shop. Want speedy updates about your flight? Many airlines (like Bering Air) post flight alerts and news to their Twitter and Facebook feeds, which you can easily check from your smartphone. It’s a handy way to stay informed about any delays or cancellations due to weather conditions when you’re on the go. Be sure to start following your airlines now so you’re not scrambling to find their feeds on travel day. It’s hard to follow your airline’s flight alerts on social media when you smartphone is out of juice. And electric outlets will be high demand among your fellow airport travelers. So the night before your flight, make sure to keep your smartphone (and any other devices you’re bringing along) charged up. Carrying a portable battery charger is also a good idea. Weather conditions can change in a heartbeat. For at least a few days before your flight is scheduled, check the weather forecast regularly. Should bad weather strike, you may need to head to the airport a little early, or wear a few extra layers for the drive there. Inclement weather may affect your departure time, and if you have a connecting flight, any delays will reduce your layover time. Also, monitor the weather forecast for your connecting airport, as winter storms may cause flight cancellations. During busy periods, such as holidays and winter breaks, finding an empty seat on another flight can prove challenging. When traveling in winter, don’t take any chances. As they say, hope for the best, but plan for the worst. Always give yourself plenty of wiggle room in your itinerary. On travel day, head out early for your flight in case snowy conditions cause travel delays. If you have a connecting flight, especially out of western Alaska to one of the Lower 48, be sure to leave plenty of time between flights. Also, keep any important items with you in your carry-on bag, like your toothbrush, medications and any devices. Having these things with you will make you more comfortable should your flight be delayed. What’s your best holiday and winter travel advice? We want to hear your ideas! Share them with us in the comments.